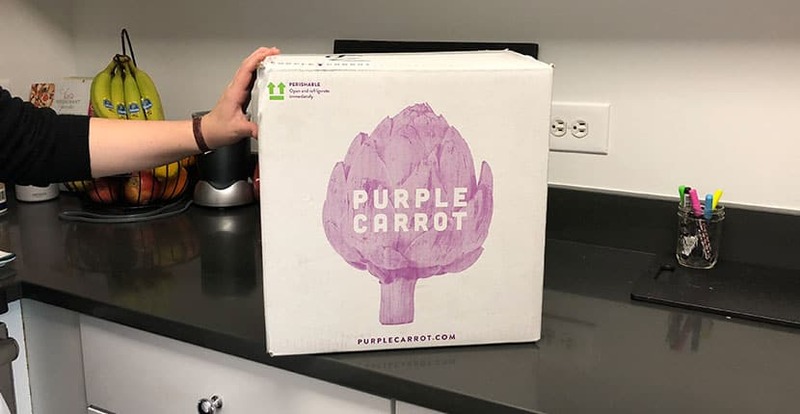 Purple Carrot Review: How Good Is This Vegan Meal Delivery Service? Are you on the hunt for the best plant-based meal delivery service? Look no further than Purple Carrot! 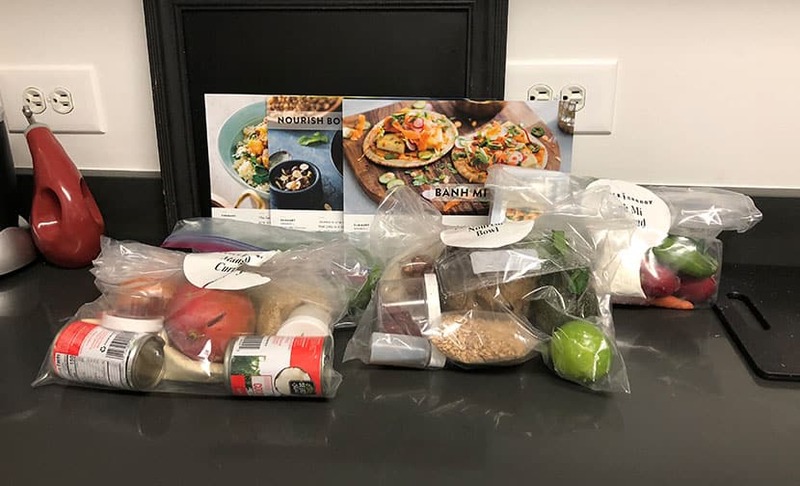 They’re a meal kit that’s designed to make healthy, vegan eating easy, delicious, and as convenient as possible for you. They’ll provide you with unique recipes that change each week, giving you plenty of variety. And all you have to do is prepare them in the comfort of your own kitchen. If you’re interested in Purple Carrot and think it might be the right vegan meal delivery service for you, we’re sharing all the details you need to know before signing up! Keep reading to discover how to join, what kind of meals you’ll see on the menu, and much more. To get started with Purple Carrot, you’ll need to first choose the plan that’s right for you. You’ll have two options, which include their basic Purple Carrot plan and the TB12 plan. With the Purple Carrot plan, you’ll receive enough servings for one to two people and you’ll be able to make three meals per week. This is perfect for a couple or for someone who loves having leftovers for the next day. Or you can opt for the TB12 plan, which has been created in collaboration with Tom Brady of the New England Patriots. These meals contain a higher protein count, plus they’re always gluten-free. You’ll still receive one to two servings for your meal and three meals per week. It’s really all about which plan is best suited for your lifestyle. Once you’ve chosen your plan, you’ll be able to select the meals for your order. Each week, Purple Carrot presents their customers with a new selection of dinners to choose from. This ensures you’ll have plenty of variety and you’ll never get bored with what they have to offer. You can always view the menu ahead of time so you can decide if you want to order or skip the week. When viewing your items, you’ll be able to see the ingredients and any allergy information ahead of time. This is important for anyone who may be avoiding certain ingredients. The culinary team at Purple Carrot has certainly made an effort to get creative with their plant-based dishes. After all, healthy eating doesn’t have to be bland or boring. You can have fun with your weeknight meals and try all sorts of new dishes. Not only will you find amazing dinner dishes like those on their menu, but they offer more than that. You can also get appetizers, snacks, salads, bowls, and desserts. At this time, Purple Carrot delivers to all of the contiguous United States. Unfortunately, that means they’re unable to ship orders to Alaska and Hawaii. However, if you’re located in any of the other 48 states, you’re good to go. Orders can be expected on Monday, Tuesday, or Wednesday each week. This will depend on the delivery options available to your zip code and you won’t be able to customize this when ordering. There’s also no need to pay any additional shipping fees. They’ve already factored that into the price of your order, so you won’t see shipping on your weekly order total. And if you’re worried about not being home to receive your order, there’s no need to panic! A signature is not required for your order to be delivered. Shipping carriers are instructed to leave the package, so it’ll be there waiting for you when you arrive home. If you’re concerned about this, you can always set “Special Delivery Instructions” for your order to have it delivered to your work if you’ll be there during the delivery window. The great thing about not having to be home to receive your delivery is that you don’t have to worry about your food spoiling. Purple Carrot packages everything carefully to ensure the ingredients stay fresh and at the optimal temperature. They use high-quality, reliable insulation, as well as ice packs. They state their orders will remain fresh for up to 72 hours, depending on the weather conditions. You will, however, still want to thoroughly inspect your order once it arrives to make sure everything is okay. We noticed that our bag of spinach did break. This isn’t the biggest deal in the world but it was a pain to collect all the leaves that were strewn about in the box. Most of the plastic containers they use are recyclable, as is the liner that’s used for their ice packs. The cardboard boxes are recyclable as well. They aren’t exactly the most recyclable meal delivery kit but they do a pretty decent job, all things considered. Due to the packaging Purple Carrot uses, your ingredients will stay fresh during transportation. Nothing in our box had spoiled—it was all very fresh. When stored properly, many of the ingredients will stay fresh for up to one week. They do recommend cooking your meals within a few days of receiving your order though. So, you’ll want to plan on eating your Purple Carrot dinners shortly after they’ve arrived. If you don’t want to have your meals three nights in a row, they suggest eating the meals with the most leafy greens first so you can enjoy them before they spoil. 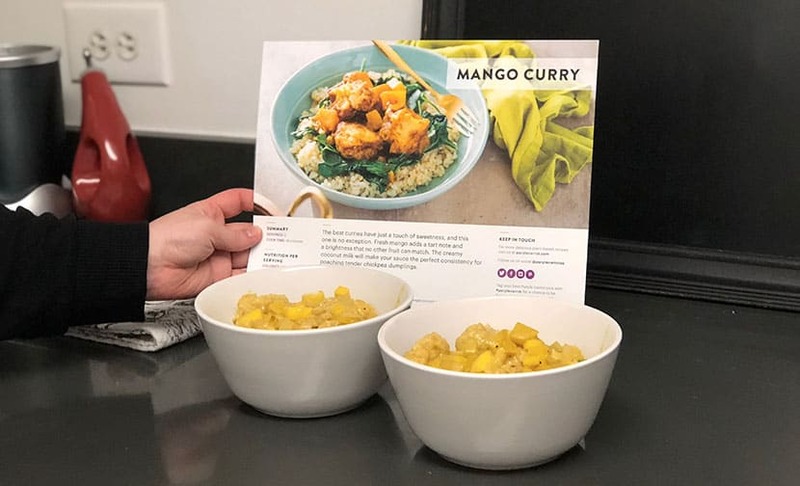 Don’t think you need to be a professional chef to prepare any of Purple Carrot’s plant-based meals. 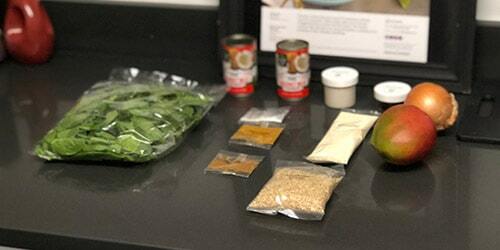 They’re all pretty simple to throw together, thanks to detailed instructions and pre-portioned ingredients. While the recipes were easy to follow, they did however involve a lot of kitchen utensils. We went through at least four different pots, pans, and bowels. This just means there is more to clean up after the meal is cooked. And you’ll want to have staple ingredients like olive oil, vegetable oil, salt, and pepper. With all those on hand, you’ll be ready to go because they’ve taken care of everything else. It’s safe to say that Purple Carrot has created some pretty impressive plant-based dishes. Not only do they include fresh, nutritious ingredients, but they taste great as well. With their menu at your disposal, you can eat healthy and actually enjoy the foods on your plant. 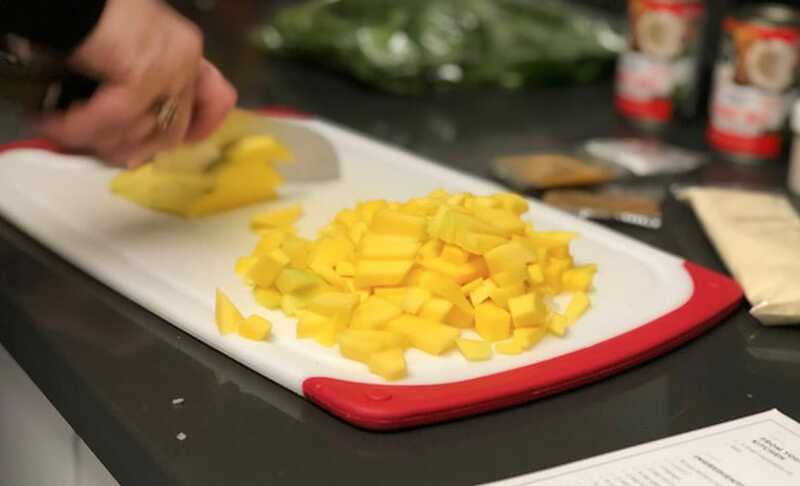 The first dish we made was their Mango Curry with Chickpea Dumplings and Spinach. For being completely plant-based, it was really delicious. Many vegan meals we’ve tried in the past have been pretty bland and lacking that extra “something” that non-vegan foods have. Not this Purple Carrot meal though—it surprised us a lot. Another one of our favorites is the Smashed White Bean and Avocado Club with Beet Dippers. It is simple to prepare, and absolutely satisfying. With gluten-free bread, avocado, and beets, it makes for the perfect springtime sandwich. It tasted fresh and was still filling, thanks to the healthy fats of the avocado. Don’t pass on the Purple Carrot desserts! The No Bake Peanut Butter Cookies are so good that you won’t even realize they’re sugar-free and gluten-free. Pricing for your order is going to depend on which meal plan you choose. As mentioned previously, there are two options to consider. You can get the basic Purple Carrot plan, which will cost you $12 per plate. Since each meal provides two servings and you’ll get three meals per week, it’ll cost you $72. The TB Performance Meals will cost you just a little bit more. These cost $13 per plate, which adds up to $78 per week for your meals. Overall, the price is pretty reasonable considering what you’re going to spend on your groceries each week. Plus, you have to keep in mind just how much hassle Purple Carrot is taking off your plate. You don’t have to stress about meal planning and you’ll have less groceries to purchase each week. You can’t beat that! *Purple Carrot pricing is subject to change. 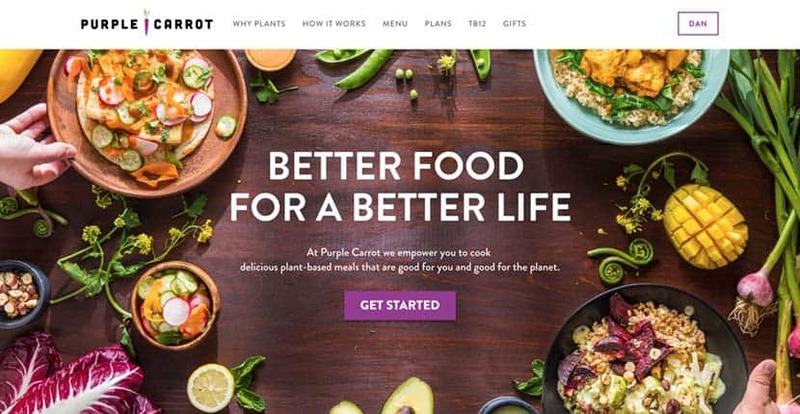 Overall, Purple Carrot is a fantastic option for anyone looking to cook delicious, plant-based meals in their own home. If you’ve been bored with eating the same old meals, Purple Carrot can help shake things up for you! You’ll get access to their menu that changes each week, while also being able to try so many new and amazing dishes. If you’d rather not cook your vegan meals, you should check out Veestro or 22 Days Nutrition. Both services deliver pre-made vegan meal kits right to your home.